Oh snap! Spring Mountain Cabernet from the Napa Valley, people!! At a SCREAMING groovy price --- collectors, high-elevation Cab aficionados, those who love rockin’ rich, bearhug-like power, DROP what you’re doing --- what a deal!!! Only a tiny bit to go around! 93 POINTS Parker! But really -- if a light, graceful red is your wine...hit DELETE. OK, for the rest of you --- pow pow POW! Spring Mountain power, depth, complexity and long ageability is YOURS. At basically half off...it’s really just incredible. How do we come up with deals? OK, sorry, FOCUS. The wine: as noted earlier...POWER. This is big, dark, concentrated and packed with layers that just unfold as it sits suggestively in your glass. Fresh and jammy black currant, baking spices, and mocha up front, then adds levels of tobacco, earth, licorice, and more dark fruit and a long vigorous finish. Just a rock-solid, perfect Spring Mountain gem. At this price??? Needless to say, not a lot today! Don’t wait! When British ex-patriots Perry and Carolyn Butler moved to California in 1982, they never dreamed they would own 42 acres of prime vineyard land in the heart of Napa Valley. They arrived in California as high-tech pioneers and founded their own computer company in the San Francisco Bay area. After routine 80-hour work weeks, the couple relaxed during weekend trips to Napa Valley, where they were bitten by the wine bug. Dreams of high-tech dominance soon turned to thoughts of returning to the land and grape growing. In 1997, their dream became a reality when Perry and Carolyn sold their computer business and founded Juslyn Vineyards on a site overlooking the renowned Spring Mountain Winery. (The name, Juslyn, is derived from the names, Justine-the Butlers' daughter-and Carolyn.) 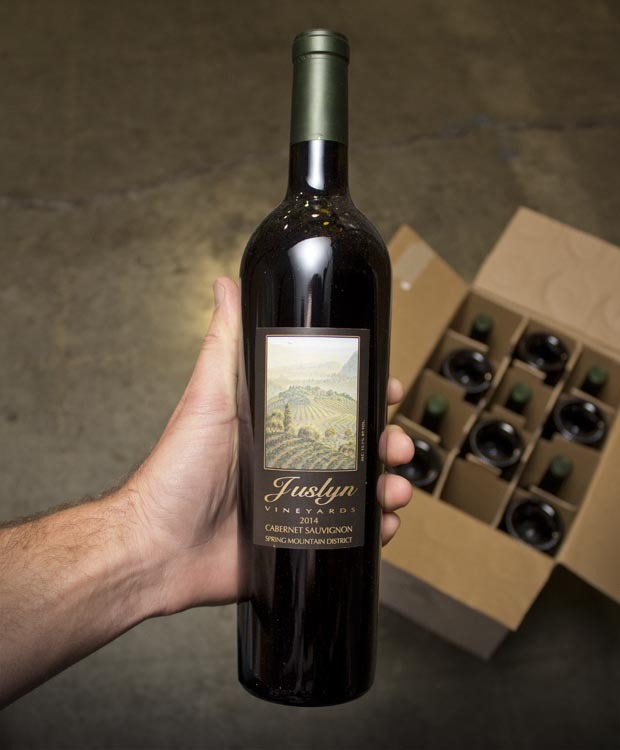 In 1998, they made their first vintage of Juslyn from grapes purchased from Andy Beckstoffer as they waited patiently for their own vines to mature. Their patience paid in 2000, when they were able to harvest their estate for the first time to produce 80 cases of Spring Mountain cabernet sauvignon.